Although there are many different kinds of delicious cakes in Vietnam, only a few cakes are considered traditional. Let’s discover why these cakes are special to the Vietnamese. Vietnam is famous for having one of the most healthy and diversified cuisines in the world. Westerners often think of cake being a sweet dessert but that is not always the case in Vietnam. Accordingly, a bunch of delicious savory cakes can be found throughout the country. These cakes were created a long time ago, deep in the history of our country and have special meaning in our culture. Vietnamese people typically eat these cakes in festivals, special events, or during Lunar New Year as a part of our tradition. Let’s discover a few interesting stories and how to make these cakes in this article. Before 258 BC, Vietnam was governed by Hung King dynasty, the first dynasty in the history of Vietnam. The legend surrounding banh chung and banh giay originated from the sixth Hung King when he wanted to transfer the throne to his sons. However, he was stuck on which prince deserved the crown. Therefore, when the New Year came, the Hung King announced that there would be a competition. The prince that offered the best gift to the king would be given the throne. The competition began! Only Lang Lieu, the 18th prince, didn’t know what to gift his father. One night, Lang Lieu dreamed of a god who suggested using rice grains to make banh chung and banh giay. Banh giay is in the shape of a circle representing the sky, while banh chung is square representing the earth. Therefore, Lang Lieu made these two cakes and this special gift made the king very happy. Then, the king immediately passed the throne to Lang Lieu. The main occupation of Vietnamese people in the past was cultivating wet rice, so Vietnamese life mainly depended on natural factors. For that reason, banh chung and banh giay has appeared on the altar for worshiping purposes. Vietnamese people pray for good weather and bumper crops, so everyone will have a full life during that year. 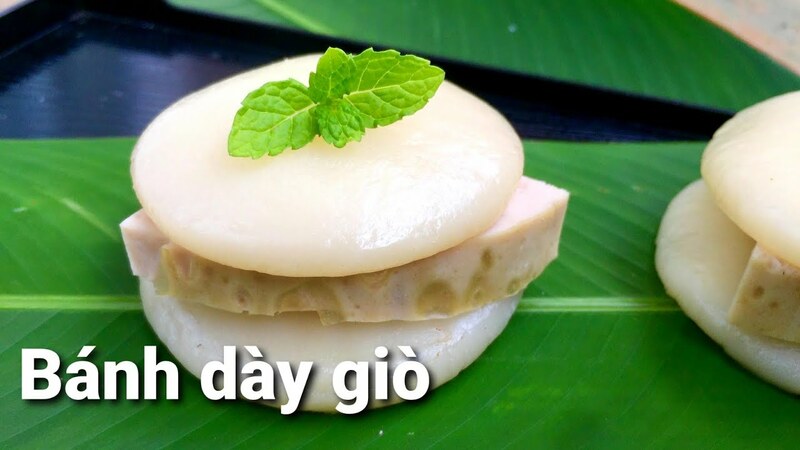 Banh chung and banh giay are a traditional Vietnamese cake that expresses gratitude of the descendants to family and ancestors. Thus, the custom of gifting banh chung and banh giay to parents is a popular tradition in our culture. In northern Vietnam, these two cakes are also an indispensable cake during Lunar New Year. 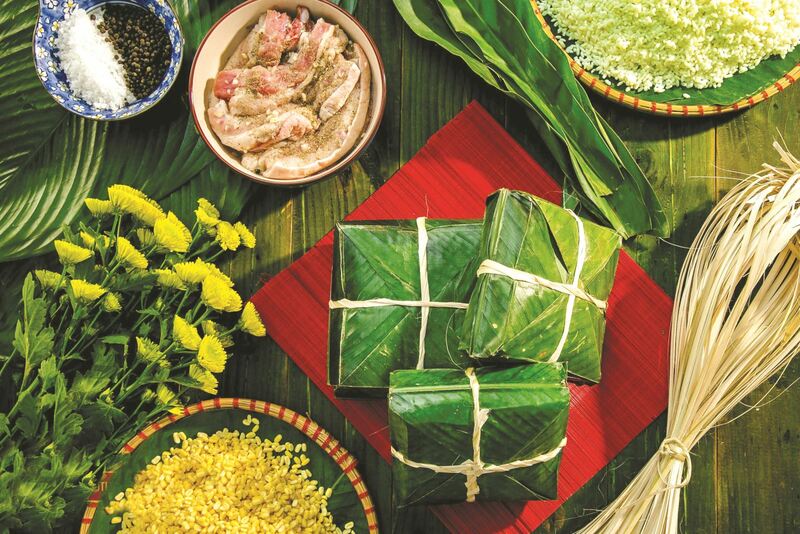 The main raw materials for banh chung are sticky rice (gao nep), mung beans (dau xanh), and half fat and half lean pork (thit heo ba roi). Pepper and salt are used to marinate the pork and flavor the mung beans. Four leaves of la dong are then placed perpendicularly on a table. The soaked rice is then prepared in the middle of the leaves. Wrap the rectangular pieces of pork into the mung bean and form it into a circle. Put the pork and mung bean into the soaked rice and cover its surface with some more soaked rice. Use your hand to wrap the leaves into a square shape and tie it with bamboo wire (day lat). 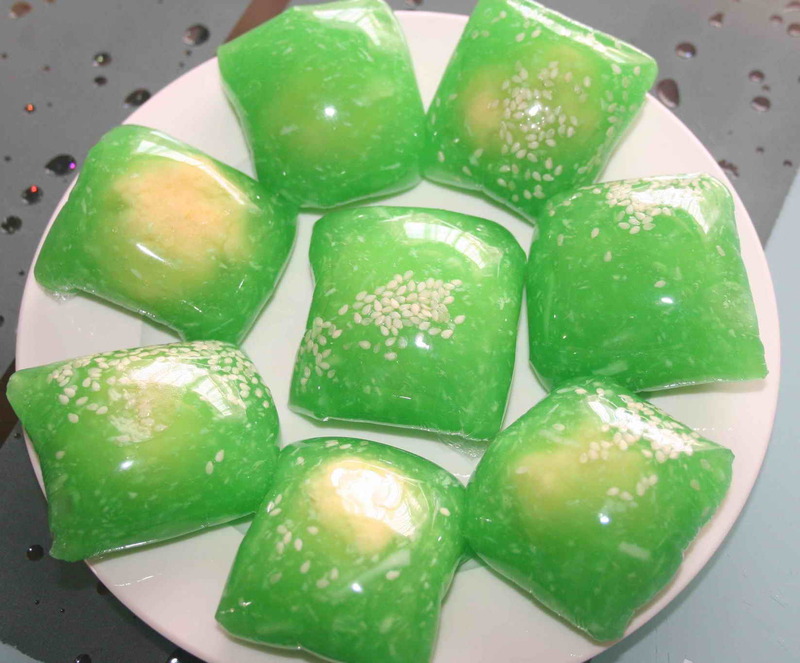 Vietnamese people often use a square mold to make the process efficient. After it’s wrapped, boil the banh chung in a big pot for over 10 hours. Some people usually check the fire and add more firewood to keep the fire small at all times, so that banh chung will have the best taste. Before the Lunar New Year, all family members usually gather together around the fire to make banh chung which is a cozy and fun time for every family. Mix sticky rice and rice flour with water, add fresh milk without sugar to increase the taste, and knead the dough. 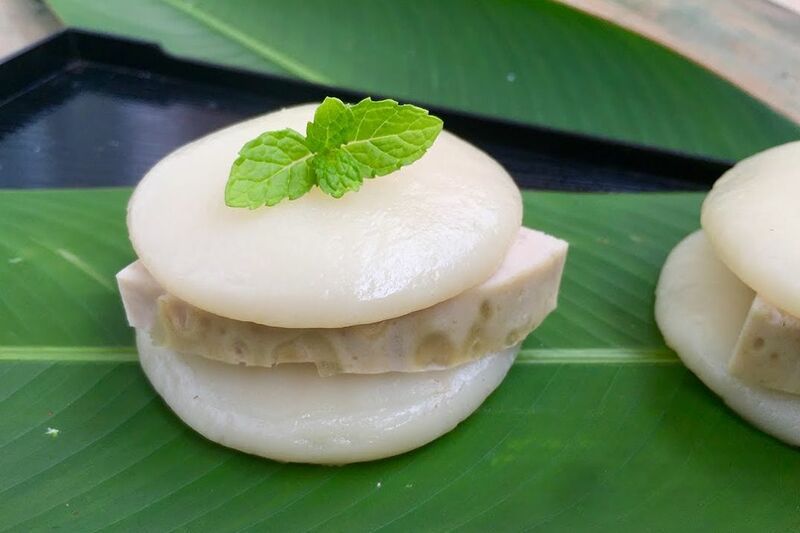 Cut the dough into small circles, place them into banana leaves, and make them into a flat and round shape. Steam these cakes for around seven minutes. Then, banh giay is ready to eat. Pork bologna can be put in the middle of two pieces of banh giay for better taste. Or the cook sometimes adds mung beans as the filling before steaming banh giay to make it more delicious. Banh chung costs around 50,000 to 125,000 VND for one cake and banh giay cost from 12,000 to 22,000 VND per a pair of cakes. The shops below and markets in Hanoi and Ho Chi Minh City sell good quality cakes. 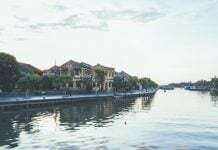 There is a legend that banh tet was created through the cultural exchanges between the Viet people and Champa, originating from the image of the Linga. Another legend tells a story of Quang Trung King. He traveled to northern Vietnam to fight the Qing dynasty in the spring of 1789. At that time, soldiers were resting and celebrating Lunar New Year. A soldier brought the cake to Quang Trung king. The king really liked this cake and asked the soldier about it. The soldier said that this banh tet had been sent by his wife from his hometown. Whenever he ate banh tet, the more he loved and missed his wife. He also was experiencing stomach aches but he did not feel any pain when eating this special cake. Listening to the story of the soldier, the king ordered everyone to make this cake to celebrate Lunar New Year, called Tết in Vietnamese, and the cake was named after the holiday. After a long time, the name of the cake transformed into Tét, which has a similar spelling as Tết. Nowadays, banh tet is a traditional cake in central and southern Vietnam. The cake is wrapped in many leaves like a mother wraps her child. 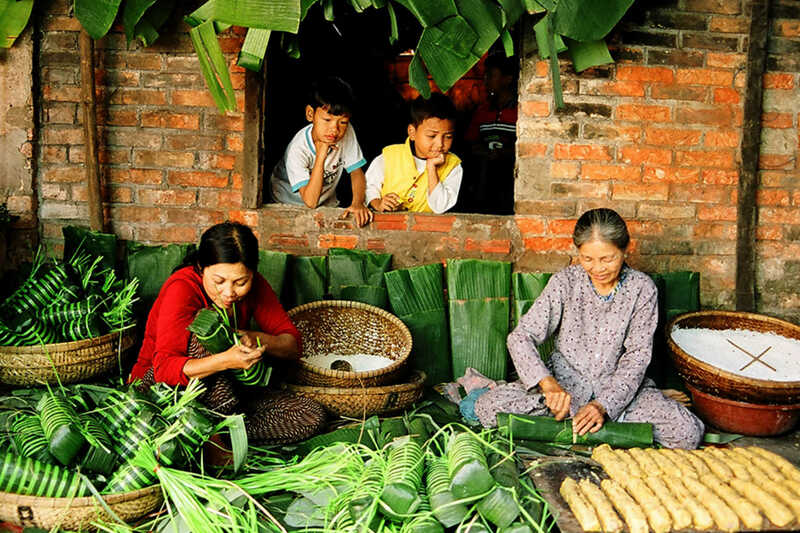 When eating banh tet, people often think of their mother, sisters, and family. 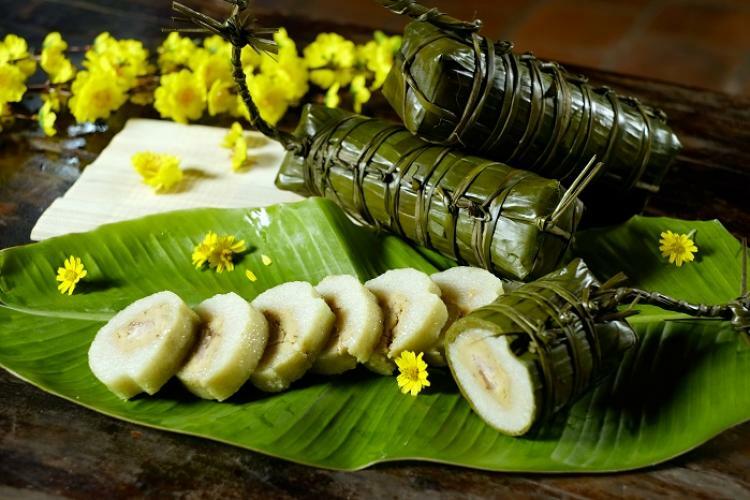 Not only that, banh tet which has green sticky rice and yellow filling is associated with the green countryside, a life raising livestock, and the peace of the village in the spring of the new year. All of these meanings honor human labor, the harmony of heaven and earth, the balance of humanity and nature, and the origin of our ancestors. Banh tet and banh chung are actually quite similar. 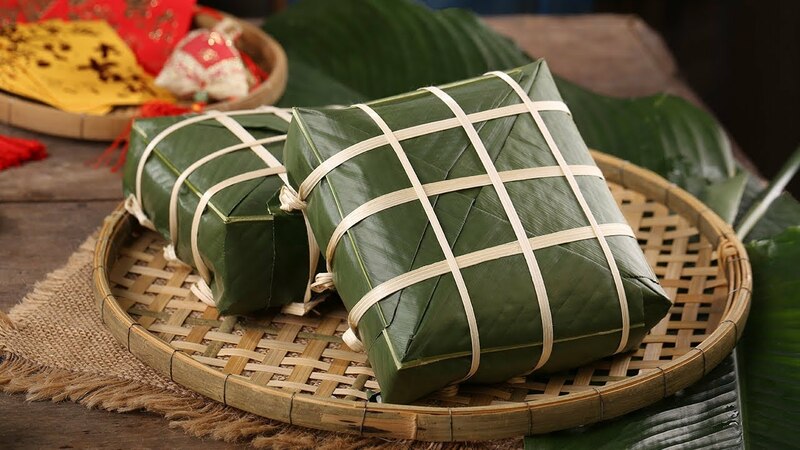 However, instead of using la dong for wrapping, banana leaves are used to wrap banh tet. When wrapping, the cook makes banh tet into a cylinder shape. Then, the cakes are boiled for many hours until they are ready to eat. Beside pork fillings, banh tet also has other fillings such as banana, mung bean, black bean, and more. The color of the cake differs as well, the cook can use the juice of local leaves to make the original white color into purple, green, and orange. Some other regions also have many different versions of banh tet that you can’t find anywhere else. Moreover, you can find and eat banh tet all year round, not only during Lunar New Year. Banh tet is around 140,000 VND for one cake. You can buy it at Nhu Lan shop, the same place to buy banh chung and banh giay in Ho Chi Minh City. Originally a specialty of Dinh Bang village in Bac Ninh province, banh phu the has become a popular cake all over Vietnam. 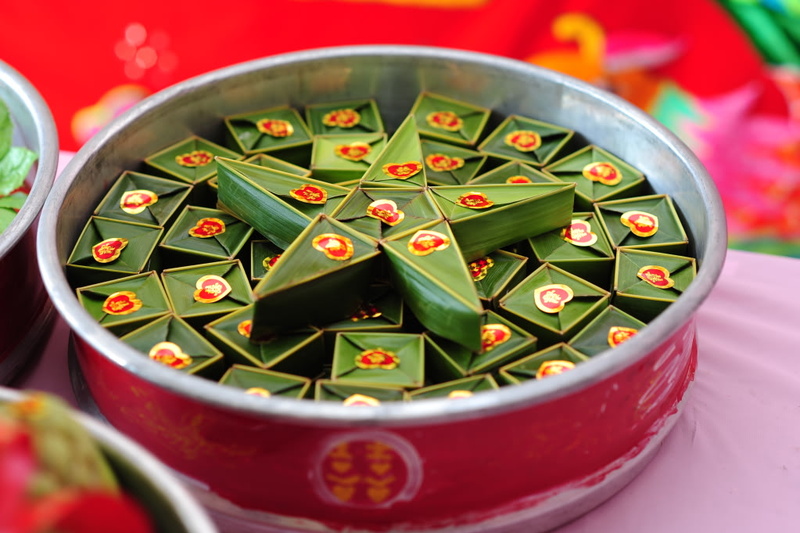 According to legends in Dinh Bang village, the villagers usually make the cake to offer to their ancestors during festivals and Lunar New Year. In a village festival, Ly Thanh Tong King and his beloved concubine, Lady Y Lan, supposedly come back to their hometown to participate in his father and grandfather’s death anniversary. The villagers dedicate banh phu the to the king and concubine, both of whom are well liked. The king said that this cake should be an offering on wedding days. From this, the cake is called banh phu the which means Conjugal Cake or Husband and Wife Cake in English. It is said that the filling encased by the dough represents the embrace and protection of spousal love. 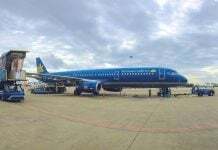 Not only that, banh phu the also represents the philosophy of five elements through its five colors. These five colors are white from the flour and coconut meat, yellow from the cake outer layer and mung bean filling, black from sesame seeds, green from banana and coconut leaves, and red from the tie that wraps the cake in the end. This symbolizes the harmony of humanity with heaven and earth, between husband and wife. Sticky rice is washed, drained, and ground with a stone mortar, then the rice starch is filtered and saved for later. The rice starch is ground again until it becomes soft and smooth. Wait 15 days for the rice starch powder to dry. The filling is comprised of soaked and then steamed mung beans which are then ground, mixed with syrup and coconut slices. Banh phu the is often cut into four pieces when eating, so four lotus seeds are placed in four corners of the filling. The cake is traditionally wrapped in two leaves. The inside layer is banana leaf because it is non-sticky. Another outside layer is coconut leaf made into a small square box. Banh phu the is then boiled over a wood stove on a low flame. Because of the rice starch powder, the cake is transparent, soft, and springy. Moreover, you can savor the crunch from coconut slices and sweet sensation from the mung bean and syrup when eating banh phu the. Banh phu the is quite cheap, only around 6,000 VND for one cake. You can find it at the below shops. With all the information above, you now know where to find some delicious traditional cakes and understand a little more about our culture along the way. 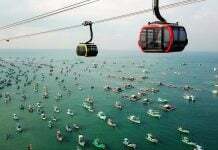 Keep reading our articles to find out more about Vietnam.